The following cases were heard under the Aroostook Criminal Docket at the Houlton Courthouse during the month of November. 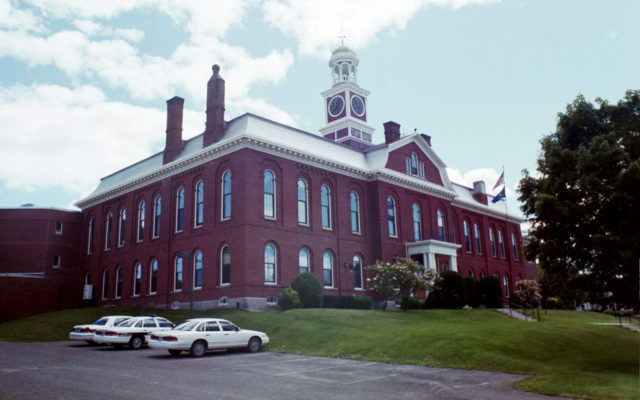 HOULTON, Maine — The following cases were heard under the Aroostook Criminal Docket at the Houlton Courthouse during the month of November. Justin King, 37, Houlton: domestic violence assault, filed without costs. John Charles White Jr., 42, Houlton: domestic violence assault, dismissed; assault, $500 fine. David N. Cobb, 70, Danforth: criminal conspiracy, dismissed; unlawful possession of scheduled drug, $1,000 fine. Giovanni Lopez, 25, Presque Isle: domestic violence assault, 90 days in jail, probation revoked. Russell C. Henderson, 61, Houlton: aggravated assault, dismissed; assault, $300 fine, 72 hours in jail. Derrick J. McAfee, 30, Houlton: refusing to submit to arrest or detention, physical force, 30 days in jail; disorderly conduct, offensive words, gestures, 30 days in jail; criminal mischief, 30 days in jail; assault, $300 fine, 90 days in jail. Benjamin M. Ireland, 23, Houlton: probation violation, probation revoked. Donald Watson, 33, Houlton: probation violation, probation revoked. Neil C. Gahagan, 35, Fort Fairfield: theft by unauthorized taking or transfer, $29.99 restitution, unconditional discharge. Chelysea Sabatis, 24, Houlton: unlawful trafficking in scheduled drugs, dismissed. Gunner A. Briggs, 21, Orient: probation violation, probation partially revoked. Danica Thornton, 41, Houlton: domestic violence assault, dismissed; disorderly conduct, offensive words, gestures, $200 fine. Jennifer Jones, 32, Bridgeport, Conn.: unlawful furnishing of scheduled drug, $400 fine, two years in prison, all but six months suspended, two years probation, $120 restitution. Hayden Fogg, 32, Houlton: probation violation, probation partially revoked. Benjamin Stewart, 30, Hodgdon: aggravated operating after habitual offender revocation, priors, dismissed; eluding an officer, three years in prison all but 18 months suspended, two years probation; night hunting, $1000 fine, 30 days in prison; shoot from motor vehicle, 10 days in prison; unlawful possession of scheduled drug, dismissed. Sarah C. McIver, 21, Littleton: unlawful trafficking in scheduled drugs, dismissed; unlawful furnishing of scheduled drug, $400 fine, two years in prison all but six months suspended, two years probation, $120 restitution. Cleveland Kenyon, 25, Weston: operating after habitual offender revocation, prior, $1,000 fine, six months in jail. Benjamin Stewart, 30, Weston: operating after habitual offender revocation, two priors, $1,000 fine, nine months and one day in prison; violating condition of release, 30 days in prison; failing to stop, remain, provide information, 30 days in prison. Jonathan Williams, 20, Bangor: domestic violence assault, 38 days in jail; probation violation, probation continued. Ricky A. Grant, Jr., 36, Crystal: aggravated operation of meth laboratory, prior, dismissed. Kristi Morris, 55, Houlton:operating under the influence (drugs or combo), two priors, $1,100, 18 months in prison all but 30 days suspended, two years probation, six years license suspension. Hope A. Phillips, 38, Presque Isle: violating condition of release, dismissed; tampering with witness, informant, juror or victim, dismissed; violating condition of release, three months in jail. Jaron A. Austin, 41, Hodgdon: disorderly conduct, offensive words, gestures, 48 hours in jail. Koby Botting, 28, Ludlow: OUI (alcohol), one prior, $700 fine, seven days in jail, three years license suspension. Cleveland Kenyon, 25, Weston: operating after habitual offender revocation, prior, $1,000 fine, six months in jail; violating condition of release, 30 days in jail. Marcus A. Toner, 29, Hodgdon: OUI (alcohol), one prior, $700 fine, seven days in jail, three years license suspension. Zachary R. Sherman, 30, Hodgdon: domestic violence assault, dismissed; disorderly conduct, offensive words, gestures, $500 fine. Janna Forsythe, 37, Houlton: domestic violence assault, dismissed; assault, $500 fine. Gregory D. Malone, Jr., 23, Houlton: domestic violence assault, 14 days in jail; criminal mischief, 48 hours in jail. Ryan Cottle, 34, Houlton: assault, $300 fine, 50 days in jail. Faith A. Fox, 32, Caribou: trafficking in prison contraband, six months in jail; unlawful possession of scheduled drug, dismissed; violating condition of release, three months in jail. Ryan B. Cottle, 34, Houlton: indecent conduct, 21 days in jail. Codi Underwood, 23, Linneus: failure to register vehicle, $100 fine. Heather Tutt, 43, Houlton: OUI (alcohol), $500 fine, 48 hours in jail, 150-day license suspension. Adam T. Maguire, 34, Linneus: operating while license suspended or revoked, dismissed. Benjamen M. Ireland, 23, Houlton: unlawful possession of scheduled drug, $400 fine, 60 days in jail. James R. Grant, 25, Houlton: violating condition of release, 30 days in jail; violating condition of release, 30 days in jail. Abdullah Reisoglu, 25, Houlton: disorderly conduct, loud unreasonable noise, $200 fine; criminal mischief, dismissed. Kyle Stevens, 32, Houlton: assault, $300 fine, 27 days in jail; domestic violence assault, dismissed; assault, $300 fine, 27 days in jail, criminal attempt, dismissed; violating condition of release, 180 days in jail all but 27 suspended, one year probation. Ryan Cottle, 34, Houlton: assault, $300 fine, 20 days in jail. Anthony P. Gonya, 49, Houlton: failing to notify of motor vehicle accident, $750 fine. Renae Landry, 30, Amity: failing to make oral or written accident report, $500 fine. David R. Pease, 21, Houlton: failing to stop for officer, $500 fine. Richard C. Cummings, 29, Houlton: operating vehicle without license, $200 fine. Jesse L. Chaloux, 28, Monticello: failure to register vehicle, $150 fine. Zachary W. Austin, 32, Oakfield: assault, $300 fine; violating condition of release, $200 fine. Katie Megan Bickford, 28, Houlton: domestic violence assault, dismissed; disorderly conduct, loud noise, private place, $200 fine, 48 hours in jail. Neil C. Gahagan, 35, Presque Isle: assault, $300 fine, 30 days in prison. James R. Grant, 25, Houlton: theft by unauthorized taking or transfer, $200 fine, $5 restitution. Michael Sanders, 23, Oakfield: failure to register vehicle, filed on $100 costs. Spencer Pelletier, 32, Sherman: motor vehicle speeding: 30-plus mph over speed limit, $400 fine. Darrin N. Cobb, 32, Houlton: violating condition of release, $250 fine. Christie L. Fraser, 41, Houlton: keeping dangerous dog, dismissed; allowing dog to be at large, $250 fine. Karen Nickerson, 54, Houlton: entering or causing a projectile to enter a place illegally, $300 fine. Yooree Ha, 20, Jacksonville, Fla.: minor having false identification, $200 fine. Jonathan Jacobs, 26, Island Falls: failing to stop ATV upon entering public way, $100 fine. Jessica L. Noyes, 34, Houlton: allowing dog to be at large, $50 fine.